Editorial: Who does What or How to Meet the Demands for Treatment? Periodontitis as a Contagious Infection: Contemporary Use of Antimicrobial Agents. Part I of this comprehensive review article dealt exclusively with the use of chlorhexidine in the practice of dentistry and dental hygiene. While it is universally accepted that chlorhexidine is one of the most effective antimicrobial agents for intraoral application, many other substances have also been proven to be effective when applied topically. Thus, Part II of this article provides in-depth descriptions of alternative agents for antimicrobial use in dentistry, by both the patient at home and the professional in the dental office. Developing Keratinized Mucosa Around Nonsubmerged Dental Implants. Despite the continued debate regarding the need for keratinized mucosa around dental implants, most clinicians are in agreement that keratinized peri-implant soft tissues are clinically desirable. The quantity of available keratinized mucosa in a proposed implant site can vary significantly due to local anatomy and/or previous surgical procedures. In many instances a minimal zone of keratinized tissue is noted prior to implant placement in the posterior regions, and in other instances, surgical incisions necessary for implant placement may reduce or eliminate what keratinized mucosa exists. Peri-implant concerns related to an absence of keratinized tissue, and often observed throughout the maintenance phase of treatment, can include tissue mobility, mucosal 'pouching', gingival hyperplasia, gingival fistulas, and gingivitis. Schroeder has postulated that the establishment of a circumferential sealing effect by a dense connective tissue collar at the site of implant penetration into the contaminated environment of the oral cavity was a pre-requisite for long-term implant success (Schroeder et al, 1981). 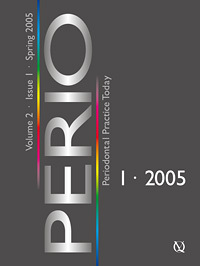 Knowledge and treatment of the peri-implant tissues will continue to be an area in which the unique expertise of the periodontist is sought and valued in the partnership with restorative dentists. Surgically reconstructing keratinized tissue at the time of implant placement minimizes treatment time and reduces total expense for the patient, improves patient comfort relative to plaque control and professional maintenance, reduces marginal tissue recession, improves esthetics, and facilitates restorative procedures. This two-part article series will focus on a variety of periodontal plastic surgical techniques designed to increase the zone of keratinized mucosa around non-submerged dental implants at the time of implant placement. Specifically, this installment will elaborate on vascularized versus non-vascularized flaps. This article aims to present the surgical technique of vestibuloplasty with free gingival graft by means of clinical cases. Cleft lip and palate patients frequently present alterations at the anterior maxillary sulcus area. Their shallow vestibule is often associated with labial immobility, lack of keratinized mucosa causing mobility of the gingival margin of teeth adjacent to the cleft and poor hygiene maintenance. Vestibuloplasty is a commonly used technique to decrease these consequences and, when associated with free gingival grafts, it can reestablish the homeostasis of the marginal gingiva. Necrotizing gingivitis (NG) and necrotizing periodontitis (NP) are considered to be different clinical stages of the same disease process and may be the first clinical indicators of human immunodeficiency virus (HIV) infection. NG/NP is a disease with distinctive clinical manifestations that respond to an uncomplicated regime of treatment. The clinical signs and symptoms of NG in HIVpositive patients are identical to those in HIV-negative patients, and the microflora is the same in either case. In contrast to the reported important role of smoking in NG/NP and periodontal disease in general, smoking does not seem to play a contributory role in the pathogenesis of NG/NP in HIV-positive patients. The lesions of NG/NP tend to affect predominantly the upper and lower anterior periodontal segments, and recurrence after treatment is not common. Some genetic disorders are associated with recurrent inflammation of the oral mucosa and with periodontal disease. Of the various incarnations of glycogen-storage diseases (GSD), type Ib is such a disorder. It is caused by a lack of polymorphous nuclear neutrophilic granulocytes (PMN) and PMN dysfunction. The present case report relates to a patient suffering from GSD type Ib and describes the oral findings between the ages of seven and 19 years. His oral situation was characterized by frequent ulcerations in various regions of the oral mucosa, persistent gingivitis, and advanced periodontal disease, initially affecting the deciduous molars (F3 furcation involvement). A comprehensive preventive dental-care program and excellent compliance on the part of the patient could not prevent periodontal destruction of the mandibular right first permanent molar (4 mm attachment loss, F2 furcation involvement). Nelken, Andrea/Basso, Matteo/Francetti, Luca/Del Fabbro, Massimo/Testori, Tiziano/Weinstein, Roberto L.
The vasculitides are a group of syndromes marked by inflammation and necrosis of blood vessels of various calibres, with luminal modifications and ischemia-induced changes in one or more organs supplied. They are primarily the expression of the tissue ischemia provoked by the damaged vessel. Their etiology is still uncertain, although viral infections are thought to be responsible for some forms. Periodontal tissues may be involved by the vessel-degenerative process. This article describes a case of leukocytoclastic vasculitis in a 23-year-old Caucasian male patient with severe necrotizing periodontitis: an average 4.7 mm full-mouth attachment loss measured involvement of the furcations and alveolar bone loss. It provides an illustration of how systemic diseases may predispose to necrotizing periodontal disease, in this case caused by tissue ischemia, and how clinicians can provide appropriate dental management of damaged oral tissues. In this study a new technique for the surgical treatment of periodontal recessions is presented along with a report on the first clinical results. A new technique of periodontal flap surgery was performed on 15 patients with severe periodontal recessions of the upper or lower front teeth. Root and soft tissue scaling was carried out with an open approach, then the periostium was incised and mobilised at the apical part of the mucoperiostium flap to be used for defect coverage before the mucoperiostium was reattached and fixed by sutures. Sulcus bleeding, periodontal probing depths, attachment loss and the length of the attached gingiva were registered for the affected teeth preoperatively and at three, six and 12 months postoperatively. Every clinical parameter was improved by surgery. No sulcus bleeding was observed at any time during the postoperative follow-up. A mean reattachment of 5.5 mm was noticed 12 months postoperatively at a mean probing depth of 0.3 mm. The mean height of the attached gingiva was 0 mm before surgery, 2.3 mm at three and six months postoperatively and 2.2 mm at 12 months. The periostium eversion technique is suitable for the treatment of gingival recessions, resulting in good gingival function and a clear improvement in aesthetics.